Boating can be a lot of fun when you know what to do. While it’s an activity that you’ll learn by trial and error, we strongly recommend that you follow the safety guidelines to ensure that you and your family or friend group stays safe during our boating adventure. Obviously, it’s vital that you learn how to maneuver the boat, but we also wanted to go over some activities to avoid doing while on a boat. In some of our past blogs, we’ve gone over safety tips to ensure that you and your family or your friends feel comfortable on the boat. Check out our Recommended Reading section to ensure that you and your family and friends are ready to stay safe while boating. 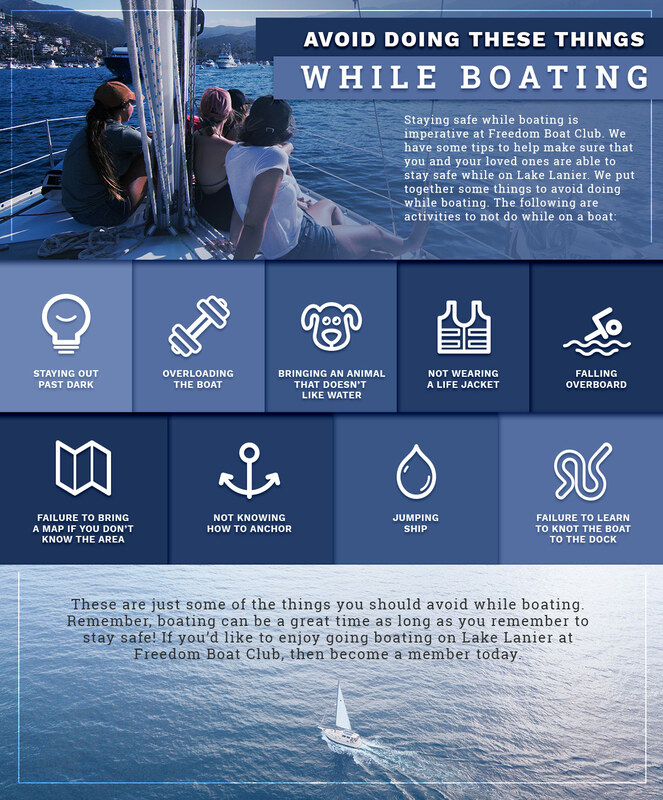 At Freedom Boat Club, we strive to provide boating safety tips that will keep you, your family, and your friends protected. Our number one priority is making sure that you have a fun time as well as a safe one. At Lake Lanier’s Oldest & Largest Private Membership Boat Club, we strive to provide you with the opportunity to go boating at an affordable price. Instead of purchasing your own boat, you can choose from our speed and pontoon boats. 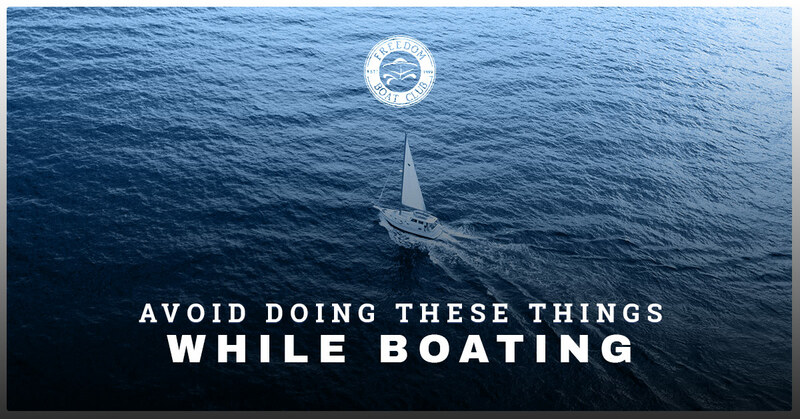 For this reason, we want to go over some tips to avoid while boating to avoid mishaps from occurring. Don’t run out of gas while on Lake Lanier! The worst thing that can happen, just like with a car, is to run out of gas while you’re out on Lake Lanier. Running out of gas is something that can easily be avoided, which is why we want to remind you to always fill up the gas tank while you’re boating. While you don’t own these boats, remembering to fill up the gas tank is imperative to ensure that you don’t get stuck in the middle of the ocean. This can happen if you have little kids who are a little too rambunctious. It’s vital that no one runs on the boat no matter how old you may be. Whether you have children who want to run or your friends get a little too toasted, running on a boat can easily lead to slipping and falling overboard, hitting the head, or another type of accident. Our last tip is to avoid going out boating at night if you have never done it before or you don’t know the area. Getting lost at night can easily be avoided if you see the sun setting and head toward in-land. It can also be avoided if you bring a map or someone who knows the area. While boating can easily make the time fly, to avoid getting lost at night, take the time to head toward the marina when the sun sets to ensure you and your passengers stay safe. We hope these safety tips will keep you and your family or friends can have an enjoyable time boating. For more information on our memberships, please reach out to Freedom Boat Club.